Cube Entertainment is already facing financial consequences for kicking out HyunA and Pentagon's E'Dawn. 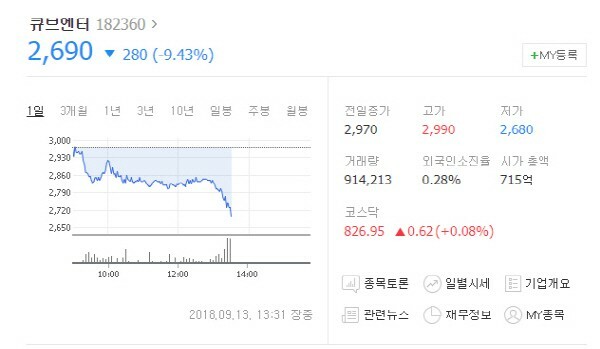 According to Kookje Shinmun, on September 13, Cube Entertainment's stock dropped 9.43% around 1:30 pm KST. The stock opened at 2,965 KRW per share and dropped to 2,690 KRW per share. This was shortly after Cube announced their decision to kick out HyunA and E'Dawn for loss of trust. Several hours later, the agency overturned their statement and said HyunA and E'Dawn's departure is not yet confirmed. Some believe Cube Entertainment might've changed their words after seeing the detrimental effect on their stock. The stock had a rally before closing as the stock closed at 2,775 KRW per share for a drop of 6.57% for the day.